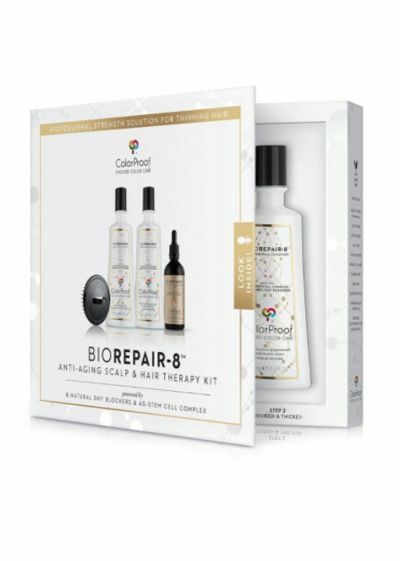 BioRepair-8 is our first skin-care inspired, scientifically advanced treatment that uniquely targets the four main causes of hair loss. We’ve harnessed advanced plant bio-cellular technology to combat the signs of aging, thinning, color-treated hair. Stops DHT absorption and prevents follicle minimization, Increases microcirculation and exfoliates the scalp, Combats follicle aging for healthy new growth cycles, Repairs the tissue responsible for the strong anchoring of new hair growth, Adds supersonic volume and thickens hair, Strengthens and repairs weak hair from the inside out and provides unsurpassed UVA/UVB color and heat protection.